Box Text: Delve into the land of dreams-turned-nightmares as Kirbyâ„¢ flies with the stars in 3D. 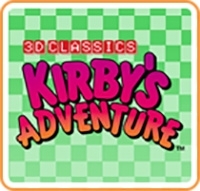 3D Classics: Kirby's Adventure offers you a chance to explore the world of Dream Land in a whole new way. The landscape comes to life as Kirbyâ„¢ crosses land, sea, and sky in his quest to restore the Star Rod. After waking from a dreamless sleep, Kirby goes to investigate the Dream Spring only to find that its source of energy has been stolen by King Dedede. Broken and divided across seven worlds, Kirby will need to use his unique ability to steal enemies' powers as he battles and to restore the pieces of the Star Rod. Without it, how can a hero fight another day if he can't get a good night's sleep? Embark on this adventure as the beloved pink character tries to save the citizens of Dream Land from a lifetime of terrible nightmares. 01-05-2013 desocietas Box Text Delve into the land of dreams-turned-nightmares as Kirbyâ„¢ flies with the stars in 3D. 3D Classics: Kirby's Adventure offers you a chance to explore the world of Dream Land in a whole new way. The landscape comes to life as Kirbyâ„¢ crosses land, sea, and sky in his quest to restore the Star Rod. After waking from a dreamless sleep, Kirby goes to investigate the Dream Spring only to find that its source of energy has been stolen by King Dedede. Broken and divided across seven worlds, Kirby will need to use his unique ability to steal enemies' powers as he battles and to restore the pieces of the Star Rod. Without it, how can a hero fight another day if he can't get a good night's sleep? Embark on this adventure as the beloved pink character tries to save the citizens of Dream Land from a lifetime of terrible nightmares. This is a list of VGCollect users who have 3D Classics: Kirby's Adventure in their Collection. This is a list of VGCollect users who have 3D Classics: Kirby's Adventure in their Sell List. This is a list of VGCollect users who have 3D Classics: Kirby's Adventure in their Wish List.